The Hunter education classes include Classroom instruction/self-study on firearm safety, wilderness safety, basic first aid, animal identification and other out of doors skills and gun safety issues. It will include the live firing of various firearms. There is a written test. An outdoor field course is also part of the class. This is a simulated hunt that includes real firearms, cars, roads, 3D targets, streams, other people, fences, and gates. There are two types of classes. The Online Skills Evaluation class is a self study online class with a 4 hour in-person evaluation class afterwards. Students will sign up for and complete the online training prior to coming in person to have the skills they learned evaluated by an instructor. The Traditional class is 16 hours long spread out over 4 days. The traditional class includes classroom study the first night, live fire on the second night, field course on the third night, and a test on the fourth and final night Students under 14 must have a parent in attendance. To register, go to the registration page and follow the directions there. At least 5 days preceeding the class start, at the RFGC club house, pick up classroom supplies, pay the deposit, read & sign Classroom contract, and sign classroom roster. Bring the Completed "manual" to the first class. 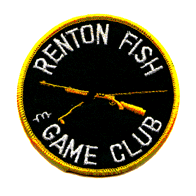 Copyright © 2012-2018 Renton Fish & Game Club.